After a day of trekking on King George Island and a good look at the 2041 E-Base, we woke this morning (Friday 20th March) on the eastern side of the Antarctic Peninsula in the Weddell Sea. This is a very different world to that experienced only 18 hours earlier. 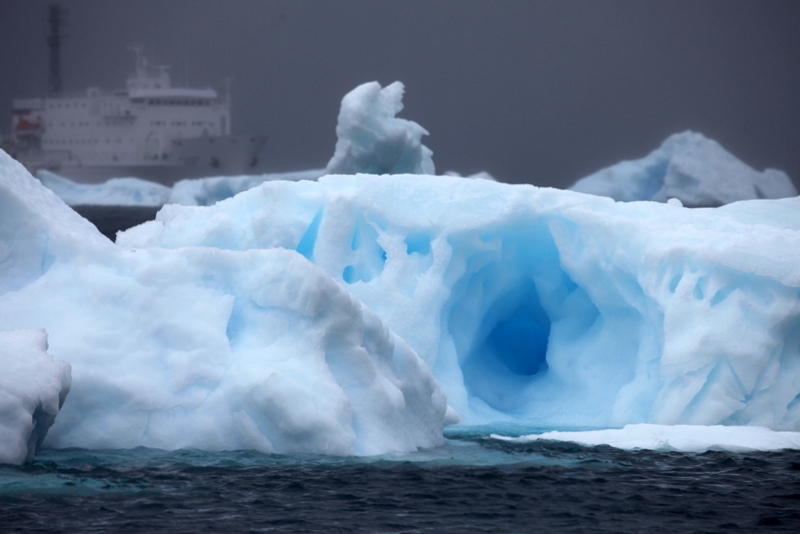 Vast icebergs litter the ocean, with the steel grey colour of the water brought to life by the eerie blue luminescence of the ice just below the surface. Not far – in Antarctic terms – south of our current location is the vast Larson B ice-shelf, much of which collapsed into the sea a few years back. Ice shelves do come and go, that is certain, but they seem to be doing more going than coming on the Antarctic Peninsula at the moment. Experienced travellers to this remote continent will confirm that ice debris in the Weddell Sea is at a high and recent research published in Nature earlier this year has presented strong evidence that the Antarctic is now showing a warming trend and that the peninsular is taking the brunt of this. In the early days of coal mining a canary was used to give early warning of gas build-up and impending doom for the miners if they didn’t change direction. The Arctic canary is long dead and the Antarctic one is looking decidedly wobbly on the perch. How many signals do we need to tell us that we must change the direction of our energy future? (Thanks to Robert Swan for this nice analogy given today in one of his “Leadership on the Edge” talks). 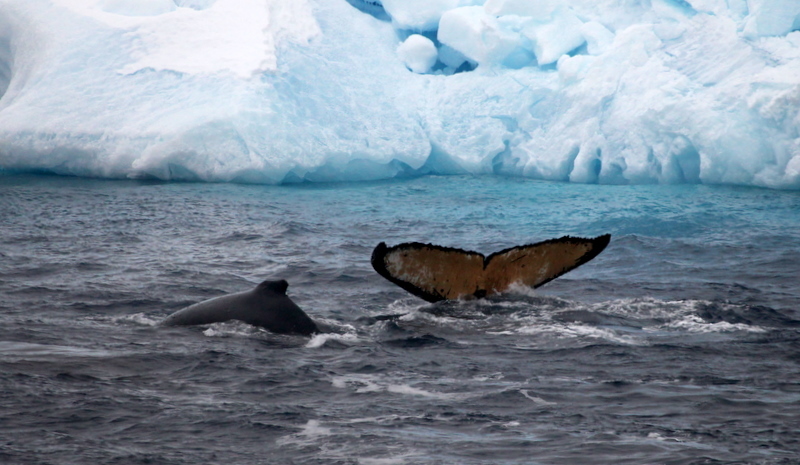 Apart from the icebergs and the calving glaciers, what else did the Antarctic have to offer today – if that wasn’t enough the expedition was captivated by a pod of humpback whales which decided to introduce themselves to the ship this morning. What started as a distant plume sighting – accompanied by a thousand digital images of pretty much empty sea – ended up with whales so close that the people at the bow of the ship were scrambling to attach wide angle lenses to cameras just to be able to fit them in. None of the expedition leaders had ever seen whales so close and even some of our Russian crew came out on deck for a look – and they have supposedly seen it all ! !